Reserve Analyst© Software provides the means of quickly evaluating the financial condition of common interest developments. You are free to create an unlimited number of math models and report configurations for each study. For the user that would prepare multiple reserve projects, the library of default reports are easily modified, customized and expanded. Reserve Analyst© is designed as a common windows architecture. You are not restricted to small operational windows or a fancy, hard to understand interface. If you are comfortable using Microsoft Office you will find Reserve Analyst easy to use. Rich text is fully supported. You can format text with the same features that are available in Word© for Windows. Format fonts and paragraphs as well as insert color photos and charts. You can add an unlimited amount of sections to your project reports. 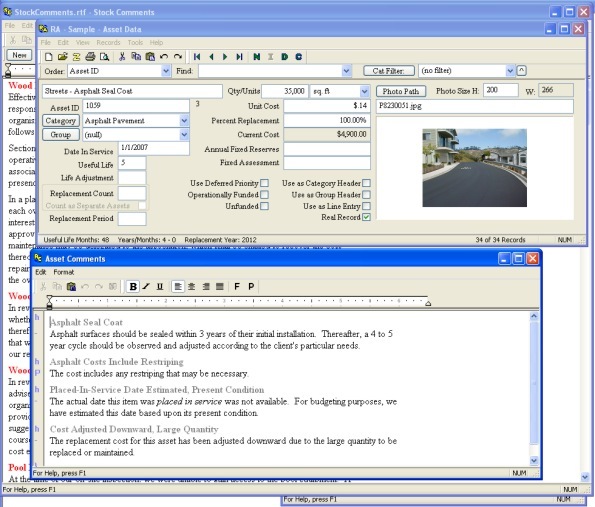 Custom documents can be created and added as a section in the report. You are able to create project documents from a stock library of documents including charts that we provide, or create them for yourself. These documents can be opened in Reserve Analyst©or Microsoft Word©. The table of contents and index of assets are automatically updated. The databases of assets are directly available to Microsoft Access© and Microsoft Excel©. 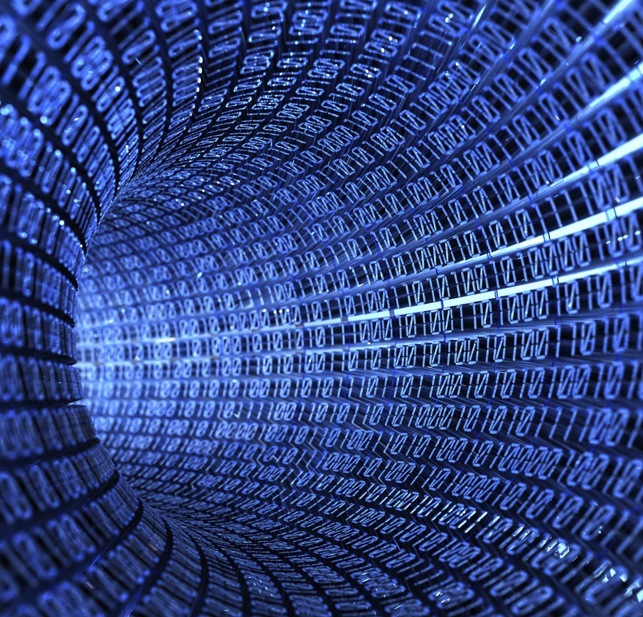 Your data is also available to multiple users over the network. You can create as many math configurations as you would like. You can also create as many reports as needed. Any set of math configurations can be attached to any report. Everything you see in the dialog below are set on a per math model basis. There are four math models on the example below. 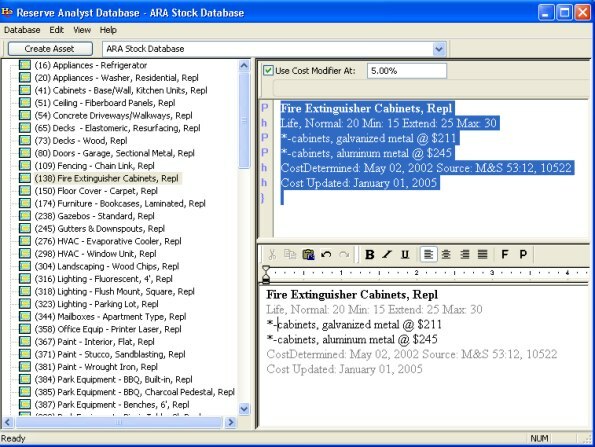 Component cost databases are included for determining the values of assets. Included are the Craftsman Book© National Renovation and Insurance Repair Estimator and the Craftsman Book© National Construction Estimator databases. Project assets can easily be created from the item currently selected in the Database window. 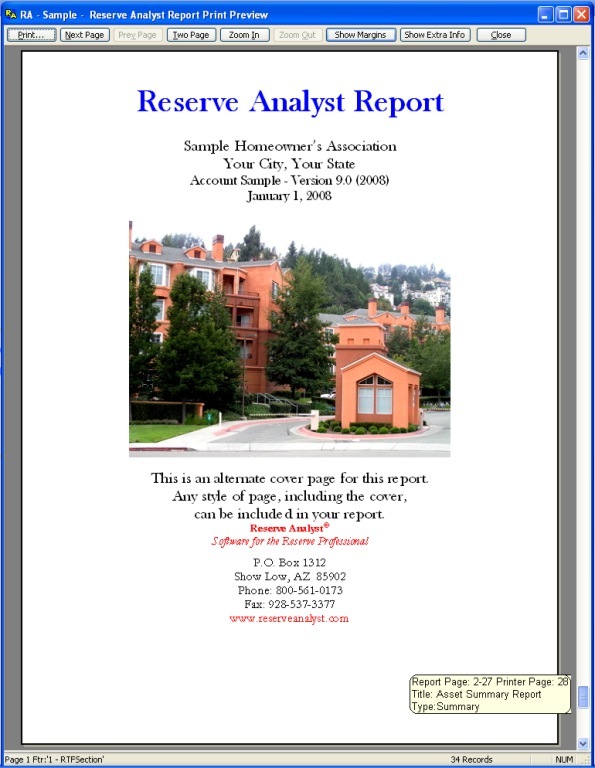 Printing can be done on any range of pages in a report. If you need to print just one page of a 1000 page report, it is done with a quick and simple print command. The complete report can be previewed on screen and will page according to the margins of the currently selected printer. An active index is displayed while moving the scroll bar in the print preview so you can quickly find any page in the report. Margins can be preset so that the print job can be split between different printers. Categories and Groups are maintained by name. Printing priority for categories and groups can be set with a quick drag and drop. You will never run out of room when inserting a new category or group. Reports are much clearer when categories are named. Download a PDF of the sample report to see how clear the presentation is. The section headers and footers can be quickly modified to reflect you information. The headers can be set at the Project Policy level as well as the Office Policy level. The order of the report sections are changed with a simple drag and drop. Report sections can be added and deleted. They can also be turn on and off for every report you have configured on a per project level. You can add as many custom sections as you like. These sections are rich text documents. They can be maintained in Reserve Analyst© or Word©. We have built in a zip archive feature giving you the ability to zip and e-mail whole, or parts of, projects right from the software. A single zipped archive of the project makes backing up much simpler. You can add or remove active photos or documents with a single click. A zip file can be directly opened in Reserve Analyst©. Just open the project or drop the zip archive right on the program window. If you are using another 3rd party software and wish to change to Reserve Analyst we are able to directly import and convert from RDA, PRA, ReservePro and Excel spreadsheets. Our conversion tools are built in and are availabe at no additional cost to you. Direct conversion from your old software to Reserve Analyst is quick and easy, saving you many hours of data entry and has you up and running with your new project in no time. We are continually enhancing Reserve Analyst©. Highlands Electronics L.L.C. is the author and developer. This means the application does not sit in a dormant version for long periods of time. It also means we have a vested interest in developing the best quality software. 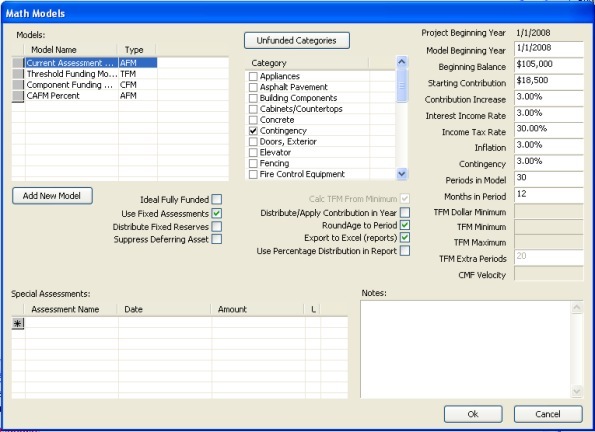 As new versions of Reserve Analyst© are released older projects are automatically brought up to date. The latest application will open projects of any version.